Picture this: It's 2008, and I've just stepped foot inside my middle school classroom—feeling quite invincible, I might add. I was breaking style rules and setting my own trends left and right—just ask any of my fellow 14-year-old friends. What was I wearing to mark myself as such a trendsetter? Abercrombie & Fitch polo shirts. Actually, multiple polo shirts to be more specific. As if one wasn't enough, I would layer mine and pop the collars just so to show off my skillful combination of teal and fuchsia and expert layering. Looking back on that time in my life and wardrobe, I usually can't help but cringe at the thought. To my extreme surprise, 10 years later, the polo shirt is now making a comeback. Don't worry—as soon as I began to notice the trend bubbling up again, I did a deep dive into my closet to find my once-beloved polo shirts with the tiny moose embroidered on the chest. Unfortunately, for strictly nostalgic reasons, those original polo shirts of mine were nowhere to be found. Luckily, though, the trend is being reinvented by designers everywhere right now. They're giving the preppy shirt a sleek and sometimes retro update that feels very now. Ahead is how I'm styling my polo shirt for spring along with a few more outfit recipes to try if you support the rebirth of the polo shirt. 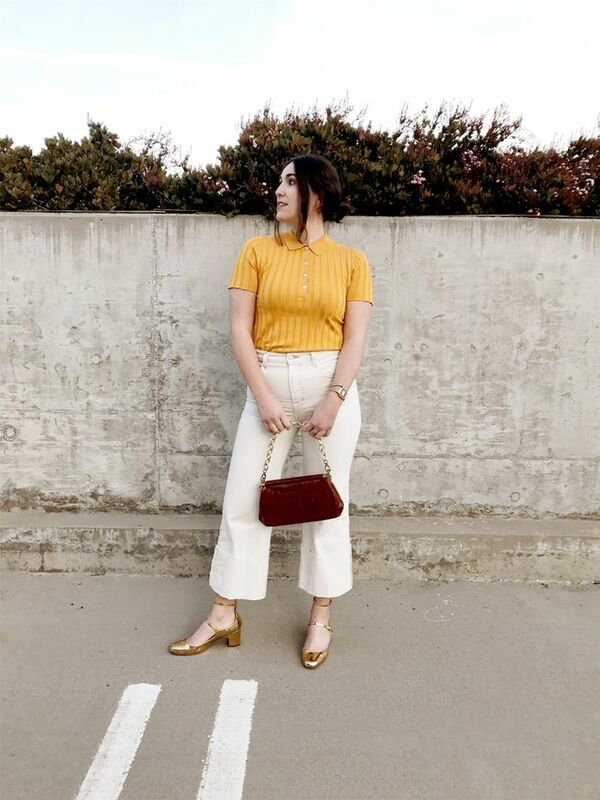 Whether you want to lean into the shirt's preppy heritage or opt for a style that's sleek and trend-forward, I've shopped the coolest polo's the internet has to offer. And, yes, you might find Abercrombie & Fitch's iconic moose-embroidered shirt in the mix. Leave it to the Man Repeller herself to singlehandedly make us want a sporty striped polo. The horizontal stripes are giving us varsity vibes. All white gives this retro top a decidedly fresh spin. This simple white polo is an easy way to test out the trend while staying true to your own style. This one is for my die-hard Abercrombie & Fitch fans. Go for a polo with an exaggerated collar for a forward feel. A polo that's anything but preppy. Pair this slightly cropped polo with high-waisted trousers. Feather sleeves and pearl buttons? It's all too much (and by that, we mean it's just enough). We're betting that this is something Betty Draper would wear. We're of the opinion that all knits should be glitter knits. Where's Waldo, but make it fashion. If Victoria Beckham says polo shirts are stylish, they're stylish. '90s kids will appreciate this one. We love the contrasting sleeves and collar on this one. Speaking of unearthing retro trends from decades past, Zara is giving us a hint that capri pants à la Carrie Bradshaw might be making a return.